The incredible journey of NASA's Opportunity rover continues. It was only supposed to last 90 days. The Martian landscape is a harsh one, so when NASA’s Mars Opportunity rover finally made it to the surface 12 years ago, they only expected to get a few months out of it — but now, the agency is celebrating the 12th anniversary of a rover that just won’t quit, according to a Space.com report. 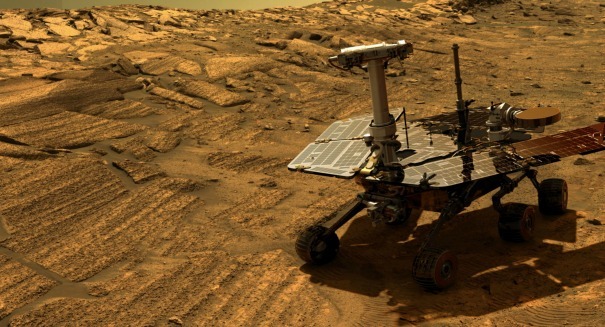 Opportunity landed on Mars on Jan. 24, 2004, along with its twin, the rover Spirit. Spirit also exceeded expectations, lasting until 2010 before it stopped communicating with Earth and was finally declared dead the next year. Opportunity, however, continues to roll along on the surface of Mars. The two rovers were given the task of finding signs of water on Mars, and they did their job, finding evidence near where they landed. Of course, Opportunity is certainly feeling its age. Its joints are a bit stiff, it has two instruments that no longer work, and it has memory problems. However, the solar panels still work, and the robot has been working on minimum power despite it being the Martian winter where it is. The Opportunity team has gotten creative to keep the rover moving, navigating it to parts of the Martian terrain that are somewhat breezy in order to clean dust off its solar panels. Right now, it’s at the Endeavour crater, a 14-mile wide impact zone, where it has been since August 2011. It is currently in the valley of the crater, called Marathon Valley, where it will stay for a little while longer this year. In its 12 years on the surface, Opportunity has now traveled as much as a marathon runner, crossing 26.5 miles of Martian terrain since its arrival.